This is the time of year when M16, The Eagle Nebula, is at its best...and the summer monsoon is at its worst. I drove out to Anderson Mesa for a long evening with M16 and some of its neighbors. An early evaporation of the days storms allowed me to dive right into the observation and I was able to spend about 45 minutes plotting stars in the field. However, as the night cooled, waves of alto cumulus began to emerge and glide across the southern half of the sky. I set the sketch aside at this point and worked on a couple planetary nebulae in clear patches of sky. By 1:30 am, there were enough openings to the south, and I was able to start work on the nebulosity surrounding M16's open cluster. The sketch proceeded haltingly for the next hour and a half as waves of cloud moved across the Milky Way. The luminous folds that comprise the nebula are subtle when compared to nearby M8, M17 and M20, but spending time with them gradually reveals some structure. I'd like to blame the less-than-perfect sky conditions for not seeing more detail, but I think that even with perfectly dry, clear air, I may not have seen much more. Dark intrusions push into the nebula from the northwest and southwest, helping to sculpt the eagle's wings. The vicinity of the Pillars of Creation periodically showed a subtly dark finger just to the south of the two bright central stars. This feature revealed itself only ten percent of the time, and I've left it softly defined in the sketch. Two stars in the cluster took on a pale yellow color when viewing without the UltraBlock filter. I prepared the original sketch in a 3-inch (7.5 cm) diameter circle. The drawing was distractingly rough when I scrutinized it later, so I redrew it in an 8-inch (20 cm) circle. This gave me much more control over the appearance of the nebula. I traced the stars from an enlarged print of my original sketch from the evening. I then used a chamois lightly loaded with sketching charcoal to apply the faint underlying base of shading. Then, using a 2H lead, I slowly and lightly built up layers of graphite to match the original drawing. Due to the large scale, I didn't use a blending stump and stuck with the chamois for any additional blending. 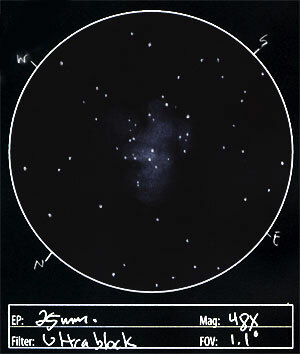 To demonstrate what a skilled observer can accomplish with modest equipment and a dark sky, please take a look at this report and sketch of M16 by Eric Graff. Using his 6-inch f/6 Parks Newtonian, Eric made this sketch two nights after I worked on mine. Notice the level of detail he was able to discern in the nebula--not only in the core, but in the very faint outer reaches. Under a dark sky, the Eagle Nebula is an enjoyable challenge, worthy of a long night dancing with the clouds. M16 lies 5,540 to 7,000 light years away in the Sagittarius arm of our galaxy. The M16 designation refers to the open cluster of stars, while IC 4703 refers to the nebulosity within which these stars are enmeshed. This nebula of gas and dust is the nursery for the open cluster and is still actively forming stars. The center of this nebula is the home to the now famous Pillars of Creation. (Barely visible as a darker intrusion from the southeast up to the central bright star in my sketch.) These dark columns of hydrogen gas and dust are the home to newly forming stars. The blazing cluster of nearby stars are gradually eroding the gas and dust around these pillars, leaving behind denser regions that contain EGGs (Evaporating Gaseous Globules)--some of these EGGs contain embryonic stars. This open cluster is about 5.5 million years old (Sky Catalog 2000 & Gï¿½tz). If it is indeed 7,000 light years distant, the cluster is about 15 light years wide, while the full extent of the nebula is about 55 x 70 light years. De Chï¿½seaux discovered the open cluster in 1745-46. 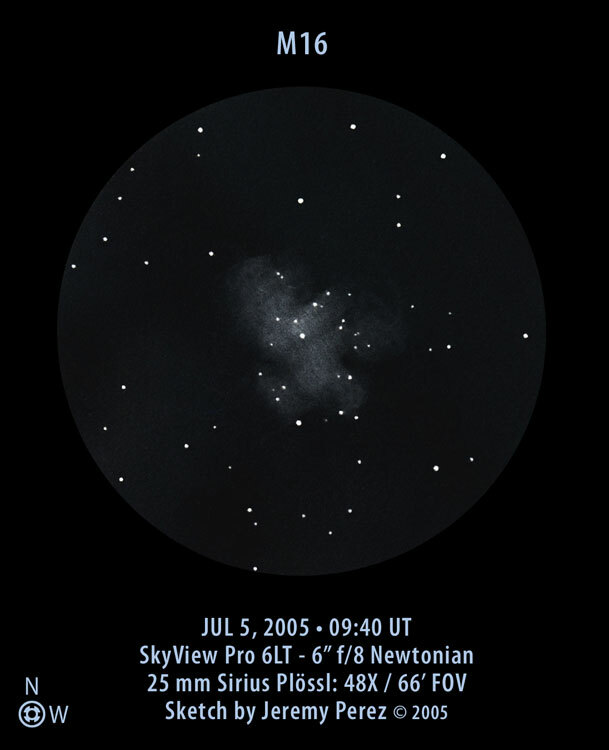 Messier later rediscovered it and noted that the stars appeared to be "enmeshed in a faint glow". 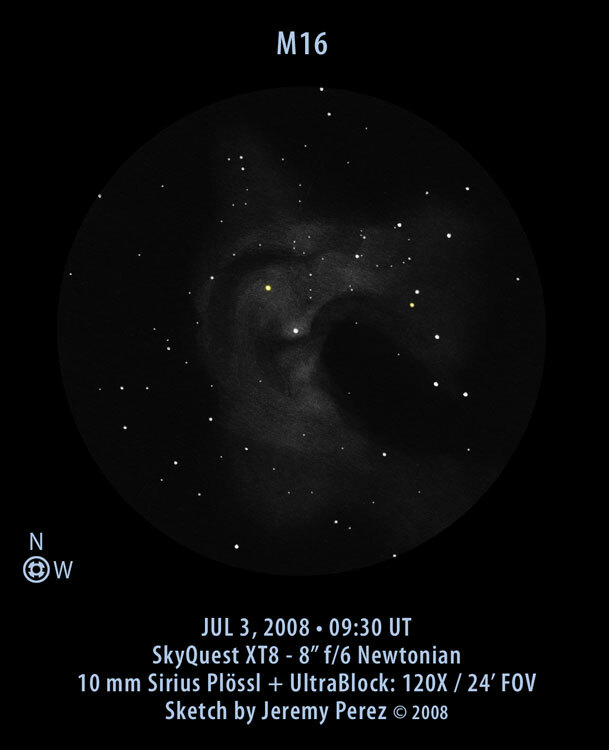 The nebula discovery is credited to Messier, although the nebula itself is labeled IC 4703. M16 is also catalogued as NGC 6611, IC 4703, Cr 375, Mel 198, Lund 825, OCL 54, h 2006, GC 4400, LBN 67, and Sh2-49. The above sketch is an update to the original to clean it up, remove the color cast, and update formatting. The original is shown below. Observation Notes: M16 doesn't give up its secrets easily. It wasn't in the best position in the sky when I viewed it. The nebula was very irregular and mottled. The brightest portion was on the north side. My impression of brighter nebulosity might very well have been influenced by the placement of the embedded cluster. There seemed to be a frond-like shape to it. Dark intrusions on the northwest and west side were complex and hard to define. There was a bit of a larger dark lagoon creeping in on the east edge. I'm not really impressed with how the sketch came out. i need questions about the Eagle Nebula! Hmmm, there are all sorts of questions you could ask about the Eagle Nebula. To start, here is a page with a nice summary of answers: SEDS Messier 16 Page. 1) How far away is the Eagle Nebula estimated to be? 2) Who discovered the star cluster of the Eagle Nebula, and who discovered the nebula itself? 3) How old is the M16 star cluster estimated to be? This page contains a single entry by Jeremy Perez published on July 15, 2008 2:14 AM. Messier 3 was the previous entry in this blog. 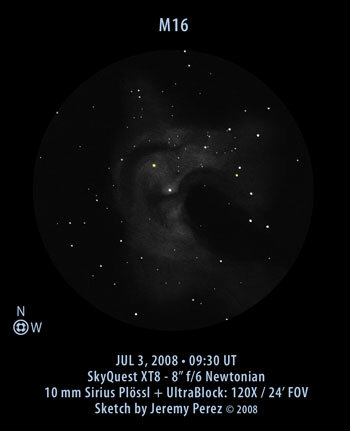 NGC 6210 is the next entry in this blog.